The Real Estate Board of Greater Vancouver (REBGV) reports that residential property sales of detached, attached and apartment properties reached 1,686 on the region’s Multiple Listing Service® (MLS®) in November, a 28.6 percent decline compared to the 2,360 sales in November 2011 and a 12.7 percent decline compared to the 1,931 home sales in October 2012. November sales were 30.3 percent below the 10-year November sales average of 2,420. 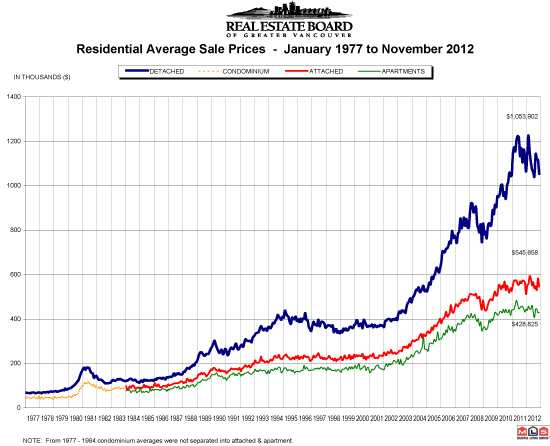 New listings for detached, attached and apartment properties in Greater Vancouver totalled 2,758 in November. This represents a 14.4 percent decline compared to November 2011 when 3,222 properties were listed for sale on the MLS® and a 36.2 percent decline compared to the 4,323 new listings in October 2012. New listings were 12.9 percent below the 10-year November average of 3,168. At 15,689, the total number of residential property listings on the MLS® increased 13 percent from this time last year and declined 9.7 percent compared to October 2012. Total listings in the region have declined by nearly 3,000 properties since reaching a peak of 18,493 in June. The region’s sales-to-active-listings ratio was unchanged from October at 11 percent. Since reaching a peak in May of $625,100, the MLS® Home Price Index composite benchmark price for all residential properties in Greater Vancouver has declined 4.5 percent to $596,900. This represents a 1.7 percent decline when we compared to this time last year. Sales of detached properties in Greater Vancouver reached 629 in November, a decrease of 31.3 percent from the 916 detached sales recorded in November 2011, and a 40.1 percent decrease from the 1,050 units sold in November 2010. Since reaching a peak in May, the benchmark price for a detached property in Greater Vancouver has declined 5.5 percent to $914,500. Sales of apartment properties reached 750 in November 2012, a 25 percent decrease compared to the 1,000 sales in November 2011, and a decrease of 28.7 percent compared to the 1,052 sales in November 2010. Since reaching a peak in May, the benchmark price for an apartment property in Greater Vancouver has declined 3.9 percent to $364,900. Attached property sales in November 2012 totalled 307, a 30.9 percent decrease compared to the 444 sales in November 2011, and a 24.6 percent decrease from the 407 attached properties sold in November 2010. Since reaching a peak in April, the benchmark price for an attached property in Greater Vancouver has declined 3.6 percent to $454,300.